Raytheon ELCAN Optical Technologies is one of the oldest and most renowned names in precision optics. ELCAN (Ernst Leitz CANada) is the legacy Leica camera facility in Canada and, as such, has roots in world-renowned German quality optics. Ricky L. Freeman served with the US Marine Corps and is currently U.S. VP of Business Development for Raytheon ELCAN Optical Technologies. Daniel Pettry is a former member of U.S. Special Operations and is currently Product Manager, Rifle Sights for Raytheon ELCAN Optical Technologies. Q: ELCAN has a long and venerable history in the development and production of precision optics that goes well beyond your battle-tested gun sight and other imaging systems for the modern war fighter. Give me a brief overview of that history, but more importantly how that translates to providing gear that meets and exceeds the unique requirements and challenges for the optical and sighting equipment used by Ground Troops and Special Forces. Ricky: ELCAN works with world-class companies to design and manufacture products that provide thought and technology leadership in their fields and solve challenges that many of our competitors are unwilling to attempt. In the 1960’s we were the first to capture detailed x-ray images of internal systems on high-speed motion picture film. This revolutionized in vitro imaging. In the 70’s it was ELCAN that helped to create a single camera, dual-film projector system to simplify the recording and projection process for IMAX®. In the 80’s and 90’s and through today we have been in the forefront of military imaging from night vision to gun scopes, to multiple platforms for target acquisition. Q: Right, so it was around the late 80’s early 90’s that you began to branch off, or specialise in Defense Imaging? Ricky: In 1990 Ernst Leitz Canada was purchased by the Hughes Aircraft Company, California, The name was changed to Hughes Leitz Optical Technologies Ltd. This strategic importance was again reinforced when the Raytheon Company purchased the defense businesses of Texas Instruments and Hughes Aircraft Company in 1997. Due to the company’s global reputation for optical excellence and technical expertise the organization took on the ELCAN brand and became known as ELCAN Optical Technologies. Our experience and commitment to optical quality, from the first 35mm cameras through revolutionary technology in medical imaging to today’s demanding requirements in infrared, LIDAR and industrial imaging, are part of each and every product that we design and manufacture. In the modern age of precision engagement and standoff capabilities, defense and security platforms require solutions that challenge the limits of technology. Raytheon ELCAN has a legacy of exceeding these challenges across markets and applications. Q: I am very familiar with Specter™ line of gun sights, specifically the SpecterDR™ dual role weapon sight as used by US Special Forces. Tell me a little about the line in general, and specifically the DR, and why that has become the “single sight of choice” by USSOCOM? Dan: Specter™ Sights by ELCAN is a complete line of battle-tested military weapon sights designed to meet the specific requirements of today’s dismounted soldier. In general, the SpecterDR™ dual role weapon sight is known for its versatility. It is the only combat sight that is specially designed for both close combat and precision shooting without the introduction of another optic to the system (ie. 3x magnifier or mini red dot). As a former member USSOCOM, I can relate to the persistent question as to what was the ideal optic for that day’s mission. The landscape in which missions took place not only changed from day to day, but often several times during a single operation. This made the choice between a reflex sight and a magnified sight very difficult. The introduction of the SpecterDR™ dual role weapon sight helped to alleviate this quandary. Because U.S. Special Operations Forces need to be able to execute in any environment at any given time, this made it a perfect fit in the USSOCOM family of equipment. Q: I believe the SpecterDR™ dual role weapon sight was designed specifically for the M4 Carbine, is that true? What other weapon system platforms is it compatible with, and/ or do you design other sights for? Dan: Originally, the SpecterDR™ 1-4x dual role weapon sight was designed for the M4 carbine. 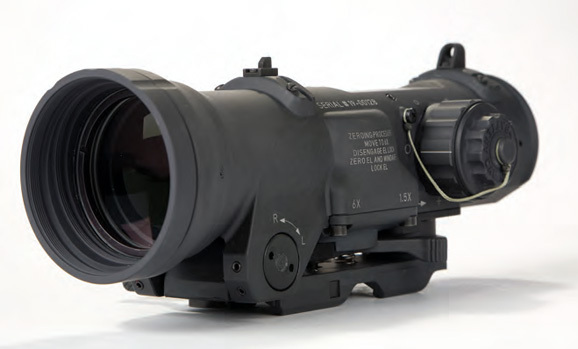 However, with the introduction of the SCAR-H to Special Operations Forces, the SpecterDR™ dual role weapon sight in both 1-4x and 1.5-6x magnifications proved to be a strategic addition for this rifle as well. This is, in part, due particularly to the SCAR’s very high shock profile. An ultra-rugged sight such as the SpecterDR™ dual role sight was necessary to perform on this weapon system. 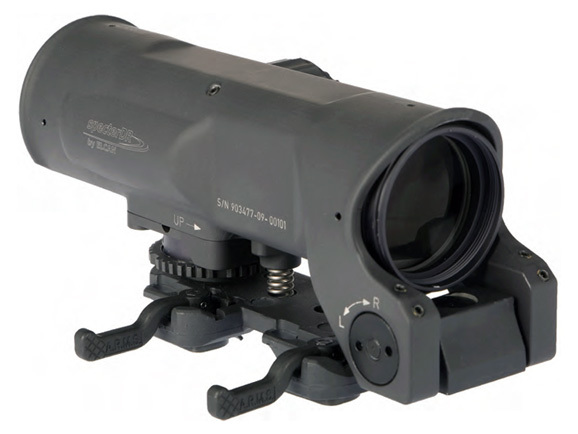 Also, in recent years, the SpecterDR™ dual role optical sight in both 1-4x and 1.5-6x magnifications have become a very popular and effective optic for light machines such as the M249 and M240. The two main reasons that these sights are so effective on a machine gun role is versatility in both urban and open environments and its ruggedness. 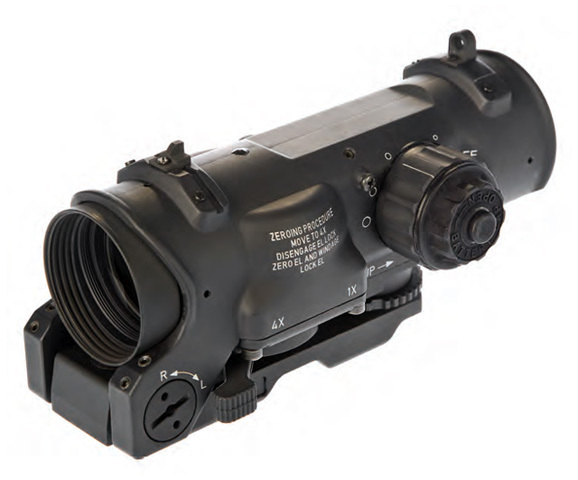 Internationally, the SpecterDR™ dual role weapon sight is used on several other weapon systems such as the SA-80 and the ARX-160. Q: Other than by US Special Forces, are you at liberty to disclose where else Specter™ Gun Sights are in use? Dan: Over 600,000 Specter™ Sights by ELCAN have been deployed with Allied forces around the world including, but not limited to: US Army, US Navy, US Air Force, US Marine Corps, US Coast Guard, and many US law enforcement agencies including DEA and FBI. Internationally, UK FIST, and the militaries of Italy, Norway, Canada, Peru, Mexico, Chile and Saudi Arabia – all use Specter™ sights. Q: Can you share general feedback you have gotten from operatives in the field that have used ELCAN sights? Dan: I have personally been dealing with feedback from Operators for nearly four years now. I can honestly say that it has been exceptional. ELCAN actually sells a high volume of commercial sights to operators that want a SpecterDR™ dual role weapon sight for their personal use. Currently, we have no “trending” issues coming from the field. Q: What are the relative advantages, disadvantages of current gun sight technologies, and with that in mind why has Raytheon ELCAN chosen to focus on products such as the Specter™ Line? Ricky: The team behind the Specter™ DVO line of products constantly attempts to strike the perfect balance among the “Big Five” optical parameters of magnification, objective size, exit pupil, eye relief and field of view. For decades, Raytheon ELCAN Optical Technologies has been successful in producing high quality, precision optics for commercial and defense applications. However, we also recognize that defense requirements are incorporating digital fire control systems that have the potential to significantly improve accuracy and lethality. In response to this trend, Raytheon ELCAN is currently developing menu-based, man-portable, modular and integrated fire control systems that will incorporate CCD and/or LCD technologies to automate functions such as ballistic computation, laser ranging and disturbed reticle solutions. Features of the system will include digital magnetic compass, auto-zeroing, auto-parallax, customizable and second focal plane digital reticles. Finally, future technology roadmaps will incorporate wind-sensing technology, video and image capture. Q: As you see it, what challenges remain in creating the “ultimate” gun sight for the Modern Warfighter, particularly in the Special Operations environment, and without revealing anything proprietary, of course, what is Raytheon ELCAN doing to surmount that challenge? Ricky: The ultimate challenge is meeting the varying and changing needs of the full spectrum of users. Rather than trying to be all things to all users, Raytheon ELCAN found a middle ground through technology to allow us to provide a flexible solution to the warfighter to facilitate operations in any environment. Challenges still to be overcome include weight reduction in the shorter term, addressing power concerns in the mid-term and introduction of a digital rifle sight in the longer term. The SpecterOS4x™ lightweight day sight is an example of the initial weight reduction solutions. Adopted by UK FIST as LDS, the SpecterOS4x™ LDS utilizes the superior optics of the SpecterDR™ 1-4x dual role weapon sight as a fixed 4x magnification sight – designed to meet specific requirements of our customer. The newly introduced SpecterTR™ 1-3-9x 3FOV weapon sight is the next iteration of the Specter™ Sights by ELCAN designed to meet these evolving challenges on the modern battlefield. Q: Beyond gun sights tell me a little bit about the other types of sensing and targeting equipment ELCAN provides for Ground Combat Troops? Ricky: In order to protect our customers’ intellectual property and competitive advantage, we cannot discuss the specifics of current projects. However, as a contract manufacturing partner, Raytheon ELCAN has extensive experience in tactical applications including: Laser Designators, Digital Displays, Visible and Thermal Imagers, LADAR, LIDAR, Precision Guidance Systems, FLIR systems, and IR & Visible telescopes.